To find out when your typewriter was made using the typewriter's serial number, start by choosing the brand from the select box below. NOTE: dates shown are JAN 1 unless noted, so the serial number shown is the *first* serial number produced the given year. Exceptions are serial numbers preceded by "up to"(where you can assume that the numbers reported in that subsection are DECEMBER 31, END OF YEAR NUMBERS) or rows where a month is given in the month column. If the serial number is shown as a range (xxxx-xxxx) it indicates that we know the entire range of serial numbers for the given year. Models and s/n Y M D Remarks Ref. * Indicates source data the current list maintainer has access to. Usually it means we have a copy of the document in question, but it might be in the form of a later edition list. However, for the purposes of validation we have been able to confirm the source. 7 * "Liste der Herstellungsdaten gangbarer Schreibmaschinen" Listing of the production dates of commen typewriters), publ. by Wochenschrift für Papier, Otto Hoffmann Verlag, 1941, Berlin, copies contributed by Mr. Paul Roberts, Netherlands. Current copy from the collection of Ryk van Dijk, scanned by Marlies Louwes. 18 * Remington Information Binder (The Sheridan Binder), 1950's to 1970's, provided by Richard Polt. 19 * Interview with P. Birchmeier, Aug. 2012, reported by Georg Sommeregger. 20 * National Office Machine Dealers Assoc. "Blue Book" (NOMDA), 1980, provided by Bill Wahl. 22 * Smith-Corona Age List #26, 1960, provided by Bill M.
23 * Shipman-Ward Office Machine Dealer's Line Book, Jan 1, 1954, provided by Bill Wahl. 24 * H.F.W. Schramm, Liste der Herstellungsdaten deutscher und ausländischer Schreibmaschinen, 11th edition, Hans Burghagen Verlag, Hamburg 1962 - copy provided by Georg Sommeregger. Additional copy from the collection of Ryk van Dijk, scanned by Marlies Louwes. "The development of the former GDR typewriter production (including typewriters produced on its territory until 1945 and production after 1990)"
31 * The Business Machines and Equipment Digest, publ. 1927 by Equipment-Research Corporation, copy contributed by Mark Adams. 32 * R. Blickensderfer and P. Robert, "The Five-Pound Secretary. An Illustrated History of the Blickensderfer Typewriter", publ. 2003 by The Virtual Typewriter Museum, excerpt contributed by Georg Sommeregger. 33 * Matricolario Olivetti, copy contributed by Enrico Morozzi. 34 * Olivetti Graphika Serial Number List, compiled by Domenico Scarzello. 35 * Liste der Herstellungsdaten deutscher und auslandischer Schreibmaschinen - 1950. By Carl Teege, Published by Hans Burghagen Verlag. From the collection of Ryk van Dijk, scanned by Marlies Louwes. 36 * Liste der Herstellungsdaten deutscher und auslandischer Schreibmaschinen - 1953. Published by Hans Burghagen Verlag. From the collection of Ryk van Dijk, scanned by Marlies Louwes. 37 * National Typewriter and Office Machine Dealer's Association (NOMDA) Typewriter and Adding Machine Allowance Schedule, February 1, 1941. From the Collection of Tony Casillo, contributed by Richard Polt. 38 * Wyckoff, Seamans & Benedict. Remington Standard typewriter. New York : Wyckoff, Seamans & Benedict, [188-? ], accessed from the Baker Library, Harvard Business School. 39 * Documented Hammond Serial Numbers, V.4 Jan. 1, 2013 through V.7 Jul 20, 2017, Compiled by Peter Weil. 40 * Blick Billheads With Serial Numbers, Compiled by Peter Weil. 41 * Olympia, USA "Allowance Sheet T-58" (approx 1977). From the Collection of Tony Casillo, contributed by Richard Polt. 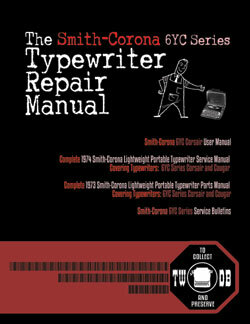 42 * IBM Typewriters Serial Numbers 1946 to 1977, Montreal Branch - IBM Canada Ltd. Contributed to Yahoo GolfBallTypewriterShop group by Jacques Coulombe. 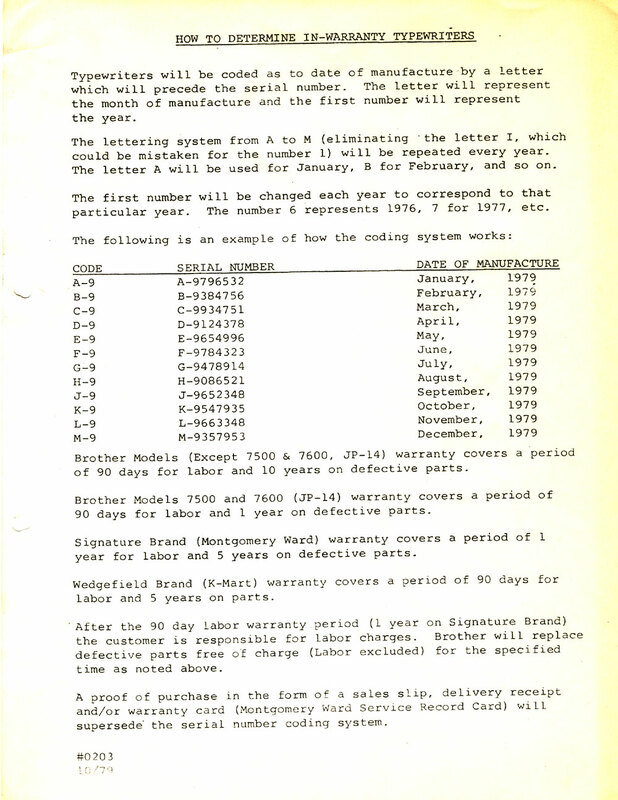 46 * Brother Letter #0203 (10/1979) "How to Determine In-Warranty Typewriters"
47 * Brother Service Manuals and Addendums 1974-1990 "The Edsel R. Sanders Collection"
48 * National Typewriter and Office Machine Dealer's Association (NOMDA) Typewriter and Adding Machine Allowance Schedule, 1977. From the Collection of Tony Casillo, contributed by Richard Polt. 56 * Europe - Oliver - SIM - MAS small typewriters, by Georg Sommeregger. 57 * The Montana line of Hermes clones, by Mark Adams. 58 * The Hermes Baby page!, by Georg Sommeregger. 59 * American Digest of Business Machines, 1924. Contributed by Richard Polt. 60 * "MTE-INV" Mesa Typewriter Exchange Stock Inventory Records 1950 to 1987. Contributed by Bill Wahl. 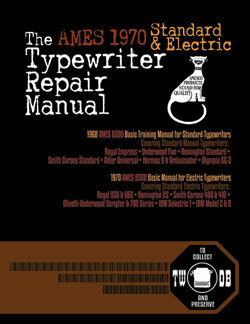 61 * "Mechanical Typewriters - Their History, Value, and Legacy" by Thomas A. Russo. 62 * "The IBM Model B typewriter" by IBM. 63 * "Remington Portables" by Richard Polt. 65 * "Collector's Guide to Antique Typewriters" Dan Post, Post-Era Books, 1981. 66 * "The Unknown Writing Machine" Don Sutherland in The Antique Trader, 1978. 67 * "Don't Mind My Insanity: Updated Fox Serial Numbers" by Tyler Anderson. 68 * "A Very Good Year for Adler Favorit 2's" by Robert Godlieb. 69 * "FBI Forgery by Typewriter: Re-Examining the Alger Hiss Case - How Did His 1927 Woodstock Become a 1929 Model?" by Robert Messenger. 70 * "The Littlest Typewriters: Bennett's Bantamweights" by Robert Messenger. 71 * "Re: [TYPEWRITERS] Bennett Typewriter on Yahoo Typewriter Forum" by Thomas Furtig. 72 * "Sabb Schreibmaschine" by Georg Sommeregger. 73 * "Discovering the Studio Musicwriter" by Theodore Munk. 74 * "The Story of the Typewriter 1873-1923" Herkimer County Historical Society, 1923. 75 * "The Early History of the Typewriter" by Chas. E Weller (1918). 76 * "Old Typewriters" by Duncan James (Shire, 1993). 77 * "Williams Typewriter Research" by Tyler Anderson, 2016. 78 * "The History of the Typewriter" by Geo. Charles Mares (Gilbert Pitman, London, 1909). 79 * "Emerson Typewriter Research" by Tyler Anderson & Peter Weil, 2016. 80 * "The Emerson: The Enigma of Typewriters" by Robert Messenger. 81 * "A History of the Three-Row 'WILLIAMS' Typewriters" by Richard E. Dickerson in Historische Bürowelt No. 21 April 1988, and No. 22 July 1988. 82 * "Typewriter Topics: Vol. 50-52 1922" by The International Office Equipment Magazine. 83 * "Typewriter Topics: Vol. 6-7 1907" by The International Office Equipment Magazine. 84 * "Typewriter Topics: Vol. 38-40 1918" by The International Office Equipment Magazine. 85 * "Typewriter Topics: Vol. 41 1919" by The International Office Equipment Magazine. 86 * "Typewriter Topics: Vol. 29-32 1915" by The International Office Equipment Magazine. 87 * "The Victor Standard Typewriter" by Will Davis. 88 * "On This Day in Typewriter History: Trying to Unravel the Victor Mystery" by Robert Messenger. 89 * "The Franklin Typewriters" by Richard E. Dickerson in ETCetera #1 October, 1987. 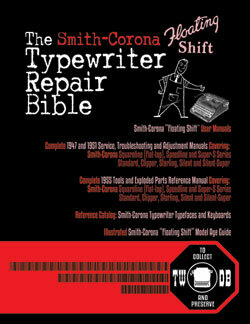 90 * "On This Day in Typewriter History (CVI)" by Robert Messenger. 91 * "the Garbell Portable Typewriter" by The Garbell family. 92 * "Garbell Typewriter" by Greg Fudacz. 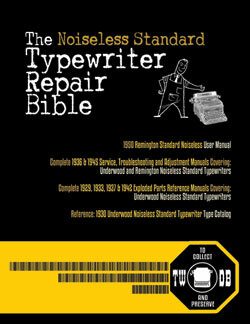 93 * "Fox Visible Typewriters - An Overview " by Will Davis. 94 * "Fox Portable Typewriters and the Demise of Fox Typewriter Company " by Will Davis. 95 * "The American Stationer" 1906. 96 * "The American Stationer" 1907. 97 * "Franklin Typewriter Ephemera" collected by Peter Weil, 2016. 98 * "A Bennington Letter" collected by Martin Howard. 99 * "Filing & Office Management Magazine" Volume 6, 1921. 100 * "Filing & Office Management Magazine" Volume 7-8, 1922. 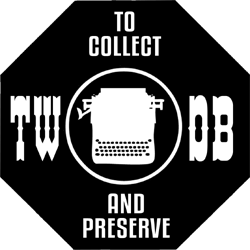 101 * "Typewriter Topics: Vol. 35-37 1917" by The International Office Equipment Magazine. 102 * "Typewriter Topics: Vol. 44-46 1920" by The International Office Equipment Magazine. 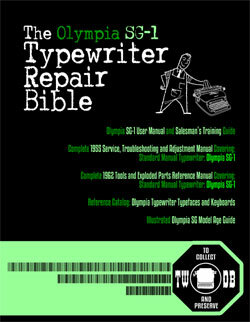 103 * "On This Day in Typewriter History: Unearthing the Molle" by Robert Messenger. 104 * "It's pronounced 'Mollie'" by Mark Adams. 105 * "The Iron Age, Volume 79 - 1907". 106 * "Office Appliances Volume 36 - July 1922". 107 * "Office Appliances Volume 34 - July 1921". 108 * "The American Pocket Typewriter and Wellington Parker Kidder's Rochester" by Robert Messenger. 109 * "Crouching Tiger, Hidden Details - The early days of the Noiseless Typewriter" by Ed Neuert. 110 * "The Merritt" by Will Davis. 111 * "Yatran The Heaviest" by Alex Sandler. 112 * "Moskva 3 and 4 age lists as of 10-2016" by Alex Sandler. 113 * "Portable Typewriters Today - February 2015" by Will Davis. 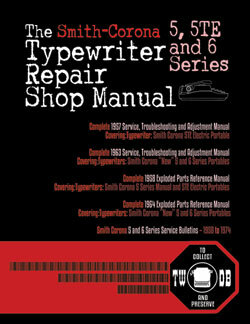 114 * "The Early Bar-Lock" and "Bar-Lock Typewriters - Models 4 to 15" by Bert Kerschbaumer. 115 * "AMES Supply General Catalog #10 - March, 1960". 116 * "AMES Supply Parts Catalog #11P - Feb., 1965". 117 * "The Amazing Masspro Portable Typewriter: 'Grandson' of the Standard Folding" by Robert Messenger. 118 * "Masspro Typewriter Page" by Greg Fudacz. 119 * "Carl P. Dietz Collection of Typewriters", by George Herrl, 1965. 120 * "Royal Paint Touch-Up Color List", Rev. June, 1968. 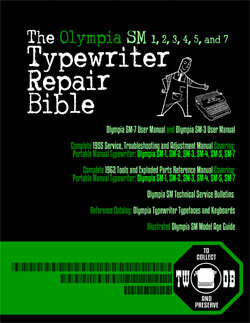 121 * "Olympia SM series (part 1, 1948-1964)" by Nick T.
122 * "Olympia SM series (part 2, 1964-1980s)" by Nick T.
123 * "AMES Supply General Catalog #5 - August, 1940". 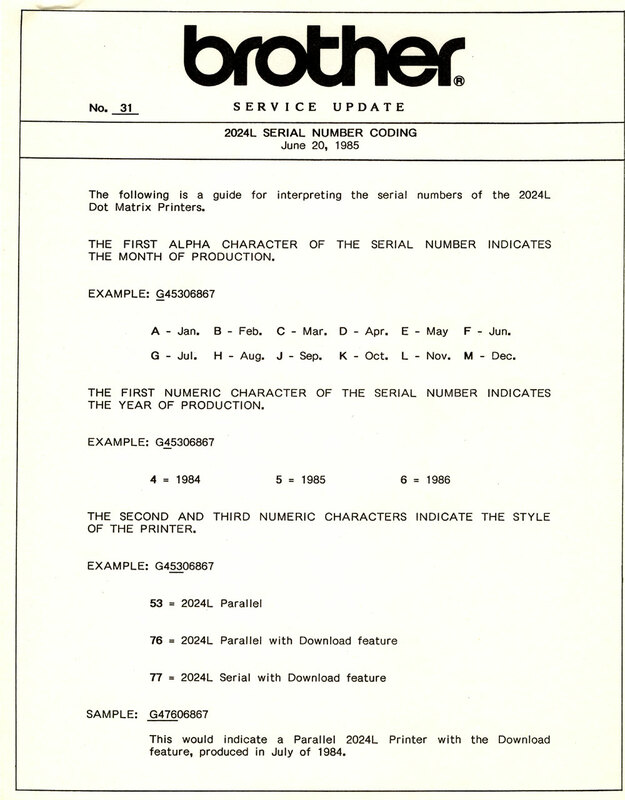 124 * "1975 Smith-Corona Model Prefix Guide", Discovered by Jonathan Kinser from Smith-Corona research. 125 * "Evolution of the Typewriter", C. V. Oden, 1917. 126 * "1912-1923 The Origins and Evolution of the Typewriter" Various Authors. 127 * "The Swedish Densmore Typewriter" by Robert Messenger. 128 * "All or Nakajima" by Steve K.
134 * "Korean Typewriters" by Robert Messenger. 136 * "Blickensderfer’s last hurrah as a Remington" by Mark Adams. 139 * "Briefly Blick-Bar" by Robert Messenger. 140 "Lexikon historischer Schreibmaschinen seit 1940" (Typewriter Lexikon since 1940) published 2008 by Leonhard Dingwerth. 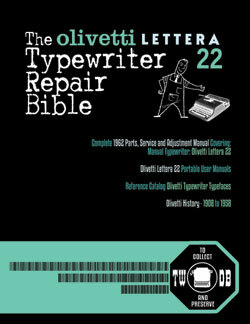 141 * "Olivetti macchine per scrivere meccaniche" published 2013 by Carlo Torchio. 142 * "The ABC in Detail" by Will Davis and Thomas Fürtig. 143 * "The Real Story of the Brosette Typewriter and its successor the Jaykay Portable" by Michael A. Brown. 144 * "A Royal Safari at Eighteen Years on the Net" by Will Davis. 145 "The typewriter industry, The impact of a significant technological innovation" 1970 doctoral dissertation by George Nichols Engler, UCLA. 147 * Typewriter pages from Sears Catalogs: 1900-1985 From the collections of Alan Seaver (mostly), Nick Bodemer and T. Munk. 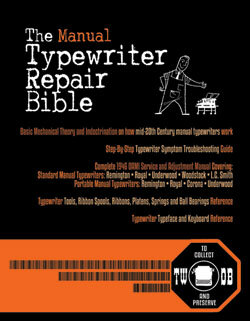 148 "Ten Most Wanted Typewriters" by Richard Polt. 149 * Messa Research by Carl Hartmann. 150 "The Dawn of the Lettera 22" by John Cooper. 151 "Litton Drags its Caravan Through the Typewriter Desert" by Robert Messenger. 152 "Typewriter review: 2019 Royal Classic" by Richard Polt. 153 "GENERATION 3000" by Will Davis. 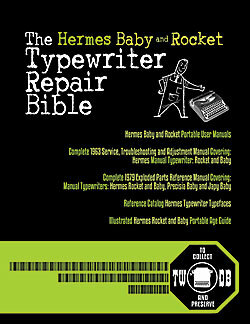 154 "Everything New in Portable Typewriters is Old Again" by Robert Messenger.